An introduction to public policy that helps students learn how to think critically about politics. Understanding Public Policy provides an introduction to the study of public policy, as well as an overview of the models that political scientists use to describe and explain political life. Offering students the tools needed to analyze public policy, author Thomas Dye highlights why governments pursue particular policies, and helps students understand the consequences of these policy choices. The fifteenth edition has been updated to reflect the key issues that have defined President Obama’s second term, with plenty of examples drawn from the headlines to help students see how public policy affects their own lives. Thomas R. Dye, Emeritus McKenzie Professor of Government at Florida State University, regularly taught large introductory classes in American politics. He received his B. A. and M. A. degrees from Pennsylvania State University and his Ph. D. degree from the University of Pennsylvania. He is the author of numerous books and articles on American government and public policy, including The Irony of Democracy; Politics in States and Communities; Understanding Public Policy; Who’s Running America? ; American Politics in the Media Age; Power in Society; Politics, Economics, and the Public; and American Federalism: Competition Among Governments. His books have been translated into many languages, including Russian and Chinese, and published abroad. Dye has served as president of the Southern Political Science Association, president of the Policy Studies Organization, and secretary of the American Political Science Association. He has taught at the University of Pennsylvania, the University of Wisconsin, and the University of Georgia, and served as a visiting scholar at Bar-Ilan University, Israel; the Brookings Institution in Washington, D. C.; and elsewhere. He is a member of Phi Beta Kappa, Omicron Delta Kappa, and Phi Kappa Phi and is listed in most major biographical directories. The book gave me the needed information to complete my course and receive an A. 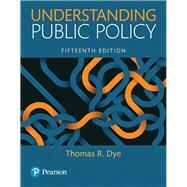 Understanding Public Policy: 4 out of 5 stars based on 1 user reviews.